This is a well laid out story. It weave two sets of murders together in an exciting and fun way. What do steeplechase, playing cards, and daggers have in common? 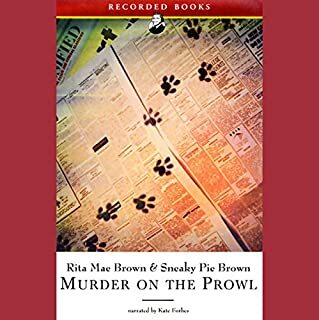 They all play vital roles in the intricately woven plot of Sneaky Pie and her human cohort Rita Mae Brown in this delightful mystery. 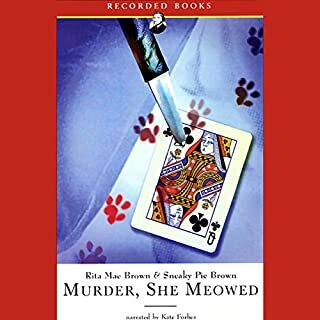 While Mary "Harry" Haristeen and her cat Mrs. Murphy attend the annual steeplechase at Montpelier, Mrs. Murphy discovers something amiss. During the celebration following the race, one of the jockeys is found dead in the barn, a dagger through his heart and the queen of clubs impaled by the dagger. Relaxing to be a cat?! Harry refects on how relaxing it must be to be a cat. Just tell that to Mrs. Murphy and Pewter-- and don't forget T. Tucker, the adorable Welsh Corgi! I love this series and even enjoy re-reading various titles. The only blemish in this book? Well, see if you can figure that out for yourself. The characters are well fleshed out and the scenery makes me want to visit central Virginia! 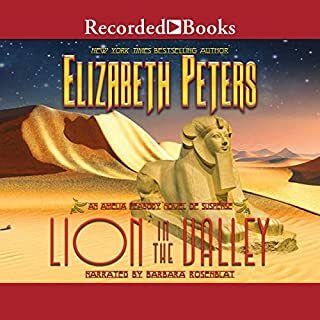 The voice of the narrator, Kate Forbes, is a delightful Virginian accent. Enjoy this book as much as I have and you will have had a wonderful escape from your daily world! Don't ask me! I am the last person to critique an Amelia Peabody book. That is because I am an unabashedly unashamed fan of the intrepid Feminist scholar and her dashing husband, Radcliffe's Emerson. 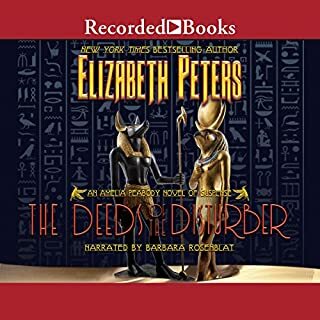 So I refuse to critique on the ground that it will reveal me as hopelessly in love with the entire Amelia Peabody Series. The interfacing between Amelia and Sethos is priceless! His appeal to her higher nature is just the ticket! Would she yield to his evil charms? Filled with frisky pets and fine suspense, the Mrs. Murphy mysteries are instant New York Times best sellers. Fans love the sleuthing team of spunky postmistress "Harry" Harristeen and Mrs. Murphy, her savvy tiger stripe cat. Mrs. Murphy, Pewter, and T. Tucker rock! 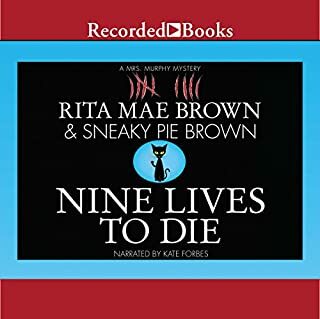 I loved this book-- but then I love all the books written by Sneaky Pie Brown! The residents of Crozet are delightful and one feels attached to certain characters right away while others take a little more time to develop. Harry, as always, is a font of curiosity. Her independent nature is softened by her reluctant vulnerability. My favorite part of the book, of course, involves the furry stars and their close brush with the bobcat. Mrs. Murphy's clever interaction with the young fox plays in nicely!